Throw Voice is a dragon shout that causes the shout to be heard from the point on a surface the player is targeting. Enemies will often go investigate the sound, allowing it to be used as a distraction. The shout has a limited range, and only fools those who have not spotted you. All three levels of the shout are identical in effect. Using more words allows a shorter recharge time. Even though all three words are learned together, each word requires its own dragon soul to unlock it. Shearpoint is guarded by both a dragon (post-Dragon Rising) and the Dragon Priest Krosis, making it difficult to obtain this shout. Using this shout while aiming at a neutral creature (such as a Giant or Mammoth) turns the creature hostile. not (the) mighty shout of his clan. The audio for the voice may not play for Argonians, Elves, female Orcs, or female Khajiit. 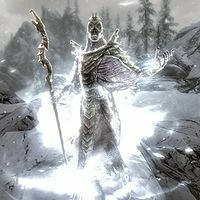 This bug is fixed by version 3.0.1 of the Unofficial Skyrim Patch. The voice may sometimes play talking to any NPC. This page was last modified on 24 June 2018, at 17:41.